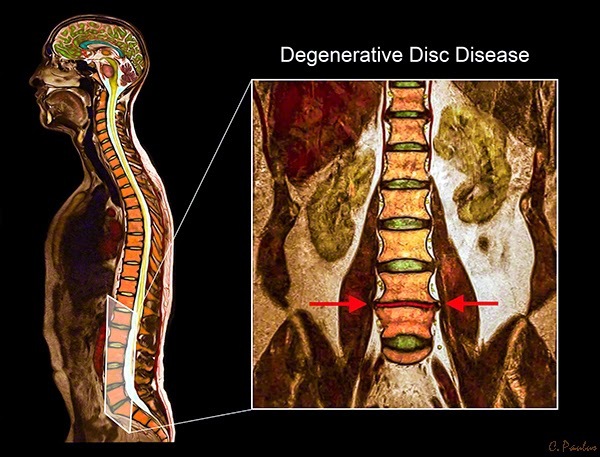 Medical Media Images Blog: What is Degenerative Disc Disease (DDD) of the Low Back (Lumbar Spine)? Degenerative Disc Disease also known as "DDD" is a very common Spine condition, most of us will experience in our lifetime. The Spinal Discs are our natural "shock-absorbers" between the Vertebrae. After so many cycles of absorbing and distributing the weight of our body, the Discs will eventually shows signs of wear and tear. Before we go into more detail about DDD, lets first take a look at the Spinal Disc and the Anatomy around it, to help us understand why DDD happens. The Image below is a MRI Scan which has been converted into Color to help you see the Anatomy more clearly. The whole body MRI on the left is designed to show you where in the body the Image on the right is taken from. This Image is Interactive. Just move your Mouse Cursor over the Image and see the Image Tags come alive. Each tag displays text to explain a specific structure. If the Image tags do not display correctly due to slow Browser Speeds, just refresh the page. Now that we have seen the Anatomy of the Low Back, lets talk about DDD. Why do we get Degenerative Disc Disease? DDD is the result of wear and tear on the Spine due to the combination of our constant exposure to gravity, the Spine's motion, and weight bearing over time. Genetics and small injuries sustained over time can cause DDD at earlier ages then otherwise expected. Who is at risk to develop DDD at an earlier age? Simply put, our Discs are similar to water-filled balloons. At Birth, our Discs are made up of roughly 80% water. So, the proper function of this "shock-absorber" is in good part related to the water content. Starting in the 3rd decade of life, we begin to lose some of the water inside the Disc. At the same time, some of the important proteins in the core of our Disc (called the "Nucleus) diminish as well. These proteins are replaced by tougher fibers called "Collagen" which do not attract and maintain water inside the Disc. This causes the Disc to get firmer and less flexible over time, just like a shock-absorber which wears out in our car. The loss of elasticity also causes the Disc to lose some of its height. This is the main reason why we shrink with age. Only a small percentage of patients who have DDD actually experience ongoing back pain. Most patients only experience mild or intermittent back pain. How is that possible? The answer is likely very complex and has much to do with our individual body chemistry, our ability to tolerate and perceive pain, our overall mental and physical health, etc. Studies have shown that up to 1/3rd of people in their 40's will have some signs of DDD on an MRI, yet less than 10% of them experienced symptoms. Does DDD cause Bone Spurs? As the Disc gets firmer and smaller, the Vertebrae next to the Degenerated Disc have to absorb more pressure and force. This causes Bone Spurs to develop. 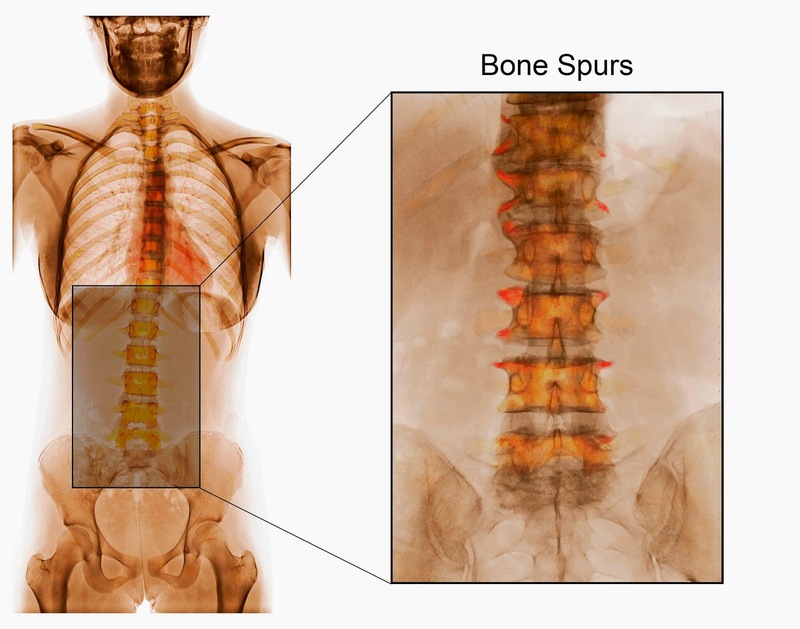 Depending on the location and size of these Bone Spurs, Spinal Nerves can become compressed potentially causing pain, numbness and weakness in the legs. This is called "Spinal Stenosis". Here is a Color X-Ray which shows the Bone Spurs from DDD. Notice the red tips coming off the Vertebrae. These are the Bone Spurs. What kinds of Symptoms does DDD cause? Does DDD cause Joint Pain as well? Each segment of the Spine is made up of one Spinal Disc in the front of the Spine and two Spine Joints (Facet Joints) on the back of the Spine. Lets take a look at another Color MRI of the Low Back (Lumbar Spine) to see the relationship between the Spinal Disc and the Spinal Joints (Facet Joints). This Image is also Interactive. What you saw in the Image above shows that the Disc and Facet Joints form a Triangle. When the Disc-part of the Triangle degenerates, more weight and mobility is transferred to the other two sides of the Triangle, which causes more stress on the Facet Joints. Like most joints in the Body, the Facet Joints are prone to degeneration and Arthritis. In this situation, both the Discs and Facet Joints can become a source of back pain. This can make a precise location and source of the Back Pain difficult. 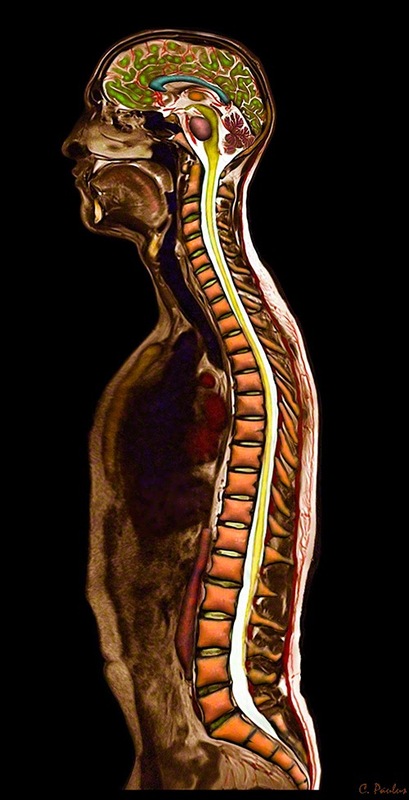 Sometimes more than part of our Spine's Anatomy causes symptoms of Back Pain. Doctors typically use a combination of the patient's history, physical examination and Radiology Images (X-Ray, CAT Scan, MRI) to make the diagnosis of DDD. While the Radiology Images can show DDD easily, it can be difficult for doctors to determine that what the Images show is the actual source of the patient's pain. The patient history and physical exam can help narrow things down. Here is what DDD can look like on a Color converted X-Ray. The red arrow points to a degenerated Disc. This Image is also Interactive. Next we can take a look at a Color Converted MRI of the Low Back to see what DDD looks like on an MRI. Notice how the Degenerated Disc has lost most of its height. This Image is also Interactive. Here is a Color MRI which shows a Disc suffering from DDD (red arrows) of the Low Back (Lumbar Spine) from the front. You can see some of the Organs such as the Kidneys (green) next to the Spine. Depending on the severity of the DDD and how it impacts on a patient's quality of life, non-surgical and surgical options exist. significant "self-help" form of treatment for DDD. combination with exercise can be another "self-help" method for patients with DDD. lost due to muscle spasms and pain related to DDD. Alternative Medicine can open a window of opportunity to help patients become more active. restore the Spine's function, maintain muscle balance, Spine stability, and mobility. inversion tables amongst others. It is generally best to research each item and read reviews. creams, e.g. Capsaicin, etc. ), low dose Antidepressants, etc. Muscles, Ligaments, and Spinal Nerves can become a source of pain. Here is a Color MRI of an Epidural Injection. This Image is also Interactive. Surgery is typically only considered as an option if all conservative, less invasive options have been exhausted and a patient's quality of life is significantly impaired. ADR's replace a Degenerated Disc with an Artificial one. ADR's are typically performed for Discs suffering from moderate to moderate-severe Degeneration. The most severe forms of DDD may involve too much Degeneration of other parts of the Spine Anatomy (Facet Joints, Spinal Nerves, etc.) to be an option for ADR Surgery. The fear is that replacing the Degenerated Disc would not eliminate some of the other potential sources of back pain. ADR Surgery is most commonly performed through the Abdomen which is the easiest way for Surgeons to gain access to a large part of the Disc. The majority of the diseased Disc is removed prior to the implantation of the ADR. Two ADRs are currently FDA approved in the U.S. (Prodisc-L, Charite), however numerous other ones are either in development in the U.S. or available overseas. The goal of ADR Surgery is to maintain some of the mobility of the diseased Disc segment. Here are some Images of ADRs implanted in the Low Back (Lumbar Spine). The bottom Disc has been surgically fused, while the two Discs above are replaced by ADRs. This Image is Interactive. Here is a Color X-Ray which shows the mobility of an ADR. This Image is also Interactive. Lumbar Fusion Surgery aims to remove the motion at a diseased Disc segment, since this motion is abnormal and thought to be painful. While Fusion Surgeries have been performed for over 100 years, the technology used for this Surgery has vastly expanded in the last decade. New, less traumatic approaches to the Spine, improved designs of the Spine Implants, and materials which can improve the chances for a complete bone fusion have given Surgeons more options and optimism. Here are some Color X-Ray Images of Lumbar Fusion Surgery. The first Image is taken from the front. This Image is Interactive. Here is the side-view Image. This Image is also Interactive. There are a number of less commonly utilized but emerging technologies which show promise as treatments for DDD. For early stages of DDD, Stem Cell Injections into the Disc are gaining ground. Also, minimally invasive treatments such as "Interspinous Process Devices" are offering alternatives to the more conventional Fusion Surgeries. However, Surgeons must determine which technology and technique is in the best interest of patients to allow patients to make informed decisions on their care. X-Ray and Color MRI Images.